English Welsh and Scottish Railway (EWS) has been officially rebranded as DB Schenker from January 1 2009, after being bought up by German state railways Deutsche Bahn (DB) in 2007. DB Schenker West combines all the freight transport and logistic activities of DB employing over 88,000 staff in about 130 countries. The buy-out of EWS was part of DB's drive to become the world's largest logistic and freight company. DB has exploited the privatisation of the European rail goods transport market created by EU directives and rail packages demanding full liberalisation of the rail-freight sector. Despite buying up other rail networks in Europe and taking stakes in London Overground and Chiltern Railways, Berlin called off the part-privatisation of the German state railway in October due to the ongoing economic crisis. However, DB boss Hartmut Mehdorn wants to take advantage of the rail privatisation process being pushed by Brussels across Europe. For instance, DB Schenker recently completed the takeover of the Romanian freight forwarding company Romtrans through a Vienna-based subsidiary. Norbert Bensel, chairman of DB Schenker, said: "With Romtrans under the corporate umbrella of DB Schenker, we are significantly expanding our presence in Romania". 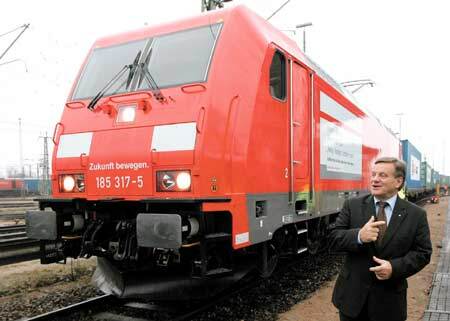 Mehdorn (right) also sees major growth for rail freight on long-­distance corridors in Europe. He pointed to the development of services to Istanbul, and the 2008 trial in which a freight train travelled from Beijing to Hamburg in 12 days - half the time of sending freight by ship. This ties in with DB's strategy of buying up operators in other countries, such as Transfesa in Spain and EWS with its French and Spanish subsidiaries, Euro Cargo Rail. Mehdorn admits that DB, with its slash and burn tactics, could never have won a license to operate in competition with France's state railway, 'SNCF Fret', because of opposition from French unions. Yet Euro Cargo Rail (ECR) by sneaking in under the radar as a small 'start-up' company - albeit one with the backing of Europe's largest freight operator - has already given DB a ten per cent market share in France, with ambitious growth plans to take up to 25 per cent. This has had a dramatic impact in France where train drivers took strike action in November 2008 against SNCF attempts to alter their terms and conditions to make them 'competitive' with private freight operators. DB Schenker will now split its operations into three regions: west, central and eastern Europe as part of ongoing expansion plans. EWS, led by its existing management, will be in charge of the west, which includes Britain, France and Spain. The central region will cover Germany, Italy, the Netherlands, Belgium, Switzerland, Denmark and Sweden. The eastern region will cover Poland and Eastern Europe. In a recent interview, Klaus Kremper, CEO of DB Schenker said: "We have become very strong in the west with our subsidiary EWS, its own subsidiary Euro Cargo Rail, and our new Spanish acquisition, Transfesa. "EWS is the biggest rail cargo provider in Britain, and it has all of the clearances for transport through France," he said. Based on feature article in RMT News January 2008.